So me wanting a tattoo isn’t news, but I’ve finally decided on a design and location. The problem I have is that I refuse to spend money on getting inked while I have debt. The process of getting funding and actually doing it, has been called ‘Project sigma’. I still want to get a grasshopper tattoo, but since I’m still looking for the right design and constantly changing my mind about where to put it, that will have to wait. 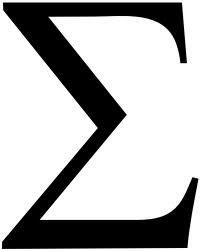 Upper case sigma is used as a symbol for the summation (the operation of combining a sequence of numbers using addition; the result is their sum or total) operator. Moving to Jo’burg has not been easy and I get very depressed about my circumstances very often. So I’ve decided that I need a constant and visual reminder that although my life has been rather miserable more often than not, I am the sum total of it – the good, the bad and the downright horrendous – and that I turned out a very good person despite (or maybe because of) it. I like the person I am; I’d be friends with me (if I didn’t live inside my head), and everything I’ve been through has contributed to shaping my personality.